Earlier this year I wrote a blog post about Vicks First Defence Nasal Spray and I was pretty positive about it. We’d all three of us used it on the early onset of a cold and it really had stopped it in its tracks, I was impressed. But today I want to share with you a bad reaction I had, which on further investigation seems quite common. This morning I woke up with a bit of a sniffle, so I reached for my bottle of Vicks First Defence Nasal Spray and used it according to the instructions. If you sniff when you spray it does burn and run down the back of your throat and is very unpleasant, so I’ve learned not to do that. Taking care not to sniff, I popped two squirts up each nostril whilst I was sat up straight and my head not tilted. I was almost instantly hit by the most incredible pain. The pain was like a hot poker being pressed on the top of my head on the right side, then forced down through my skull and down my neck. Over the first few minutes it radiated through the right side of my skull and through my right ear. In an attempt to try to get some of the Vicks First Defence Nasal Spray out of my nose, I gave it a good blow, which may have helped I don’t know. Every tooth on the upper right side of my mouth hurt and I had to lie down in the dark for over three hours. I took painkillers and slept, I couldn’t physically have done anything else. This is what I imagine having a stroke feels like. When I woke up later, the pain is less, but the top of my head is still throbbing and fizzing, I have earache and my eyes are aching. I feel rotten. As soon as I felt able, I propped myself up in bed and googled “Vicks First Defence Nasal Spray bad reaction” which brought me to the Amazon reviews for the product. I filtered them so I could read the (49 at the time of writing) 1 star reviews and almost every one of them complained of a similar reaction. Image above is a screenshot taken from Amazon. The Vicks website gives a comprehensive list of the possible side effects, but it does not mention the searing intense pain that myself and other users have reported. I’m sharing this information with you, not to stop you from using the product, because it has worked for me over and over in the last six months; but to say if this side effect happens to you, you know it’s not just you. If you are worried, contact your GP. It’s just over four hours since I used the spray now and my head and neck are throbbing and achy. I took painkillers, I’ve drunk plenty of fluids, I lay down and rested as much as I could. It’s not as acute as it was but it feels like it had probably settled in for the day and many of the 1 star Amazon reviewers said the same. It could be that I am just suddenly sensitive to the ingredients. But I have used it several times over the last six months with no ill effects. I wont be using Vicks First Defence Nasal Spray again, I’d rather have a cold than feel that pain again. If you experience any bad side effects when using Vicks First Defence Nasal Spray or any other medicine, you can report your experiences to The Medicines and Healthcare products Regulatory Agency here. Note: This blog post does not constitute medical advice, I am just sharing my experience of this product. It’s February and we are slap bang in the middle of cold season; not that there’s ever really a time when you can’t catch a cold. With school being like it is – a festering swamp of germs. Bugs, viruses and colds can knock a whole class out for weeks at a time and kids are having sick days left, right and centre! Inevitably the kids bring home germs and the whole family goes down. Whilst we make every effort not to take any unnecessary time off school and work, sometimes a sick day is what you need to knock the bug on the head. As a parent, the problem with sick days is that you don’t want them to be too much fun, you don’t want to give the idea that being at home is more fun than being at school, but you still want to be able to offer comfort and care to your child. The boy has had thankfully very few sick days off school. But when he has I always make sure he’s warm and comfortable. Snuggled on the sofa under a blanket is fairly standard. He might watch TV for a while, or do some colouring or work his way through an activity book. We will often read to each other and we will always have as many cuddles as he wants or needs. It’s a difficult balance to strike between keeping him entertained but not making it too exciting, so he won’t want more fun sick days at home. 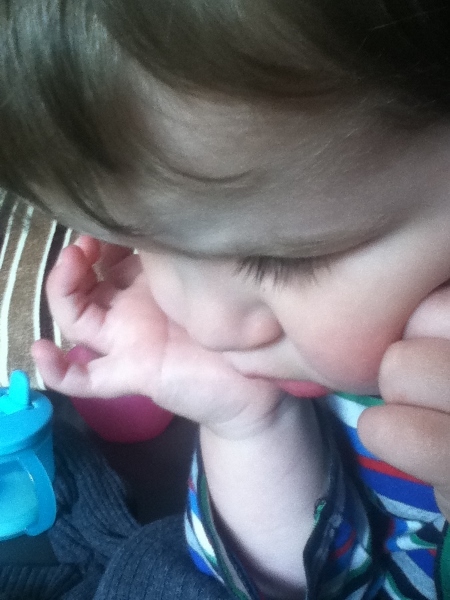 In terms of looking after him when a cold hits, I let him drink as much water or watered down fruit juice as he wants. He’s not yet discovered the comforting hug in a mug a hot cordial can be, but that will come. If he’s suffering he can have some paracetamol medicine, and I encourage him to just keep blowing his nose. If he’s snuffly and coughing at night, the old trick of Vicks Vaporub on the feet really helps. Of course prevention is always better than a cure. We are big on hand washing and trying to avoid getting the bugs in the first place. At the first sign of a cold, we adults start taking zinc supplements and praying for mercy. We’ve recently discovered Vicks First Defence. You spray it up your nose a few times a day at the first sign of a cold. It helps to stop the cold bugs in their tracks. I admit to being a little skeptical, but last week I woke up with a tickly throat and reached for the Vicks First Defence Nasal Spray. It was easy to use and I used it for a couple of days and it really did seem to stop the cold in its tracks. I just don’t have the time to be fighting bugs, so this will be part of my bug battle armoury from now on. This post is an entry for the BritMums #VicksTricks campaign.